The SUNY College of Environmental Science and Forestry (ESF) is one of the nation's best institutions for undergraduate education, and gets high marks for residence hall quality, according to The Princeton Review. The education services company features the school in the new 2015 edition of its annual college guide, "The Best 379 Colleges" (Random House / Princeton Review). This is the first time ESF has been included in the publication. 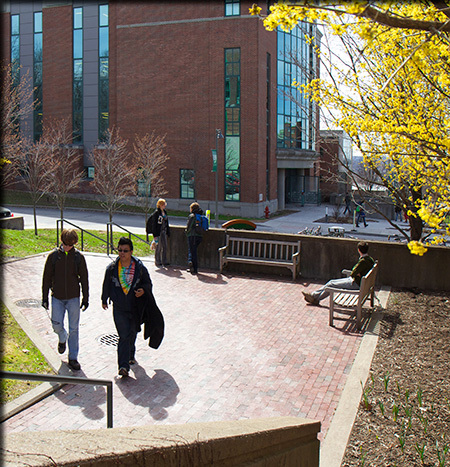 "I am delighted by The Princeton Review listing," said ESF President Quentin Wheeler. "That ESF is among the best colleges in the country does not come as news to our students or alumni who are aware of our unique community of scholars, explorers, scientists, engineers, designers and innovators that has a consistently positive impact on science and society. For anyone passionate about the natural world and committed to the vision of a better tomorrow, I cannot imagine a better college than ESF." Responses from a survey of current students are an important factor in the annual rankings, and The Princeton Review quoted ESF students as saying the college "is a great school for those interested in research and theory" and that students are "out in the field learning how to do what they want to do in life." Said one transfer student: "ESF is definitely the best 'bang for your buck.' I attended a private university prior, and I have paid for four years what one year costs there. And the courses are just as well taught." One student described the student body this way: "There's extremes here at ESF…It's likely that you'll see someone with bare feet, dreadlocks and a tie-dye t-shirt walking around campus, and there's people who dress in slacks everyday. The typical student is usually happily between the two extremes, and spends a lot of time in the library and/or the computer labs!" Another student noted: "Attending SUNY-ESF means being surrounded by people who are passionate about the earth and science in general, while all having unique perspectives and interests to share." ESF earned its highest marks as No. 20 in two categories: "Best College Dorms" and "Election, What Election?" The dorm designation is not surprising to ESF students living in the college's LEED (Leadership in Energy and Environmental Design) Gold-Certified Centennial Hall. The building, which is being expanded this summer to increase its capacity from 452 to 536, opened in 2011, the year the college celebrated its 100th anniversary. It features large suites with private bathrooms and Stickley furniture that was custom-designed and built with sustainable hardwood. Most importantly at ESF the building incorporates a host of environmentally friendly features. The "Election, What Election?" ranking might suggest ESF students are less politically involved than their counterparts elsewhere, but Wheeler has a different theory. "Our students care passionately about any issue that involves the health of the environment and they don't hesitate to become involved in causes they believe in," he said. "We have degree programs that include environmental policy, planning and law, so we know that's an important interest here. But as a college with lots of future scientists and engineers, ESF students often prefer to formulate their opinions on research and data, rather than ideology. That might set them apart in the political realm." Only about 15 percent of America's 2,500 four-year colleges are profiled in the book. The publication is The Princeton Review's flagship college guide. It includes detailed profiles of the colleges with rating scores for all schools in eight categories, plus ranking lists of top 20 schools in 62 categories based on The Princeton Review's surveys of 130,000 students attending the colleges.